VATICAN CITY (AP) — Pope Francis tempered his Easter Sunday message of Christian hope with a denunciation of "blind" terrorism, recalling victims of attacks in Europe, Africa and elsewhere, as well as expressing dismay that people fleeing war or poverty are being denied welcome as European countries squabble over the refugee crisis. Tens of thousands of people patiently endured long lines, backpack inspections and metal-detecting checks Sunday to enter St. Peter's Square. Under a brilliant sun, they listened to Francis deliver the traditional noon Easter speech from the central balcony of St. Peter's Basilica. To their delight, Francis completed a whirl through the square, made colorful with sprays of tulips and other spring flowers, in his open-topped pope-mobile after celebrating Mass on the steps of the basilica. He leaned over barriers to shake hands, as the vehicle ventured past the Vatican's confines, with his bodyguards jogging alongside on the boulevard. In Jerusalem, the cavernous Holy Sepulcher church — where Christians believe Jesus was crucified, buried and resurrected — was packed with worshippers commemorating the day they believe Jesus was resurrected in Jerusalem some 2,000 years ago. For years, Islamist extremists in social media have listed the Vatican and Rome as potential targets due to hosting the headquarters of the Roman Catholic church and several basilicas. Despite the threats, Francis has kept to his habit of trying to be in close physical contact with ordinary people. Francis said, for the faithful, Jesus who rose after death by crucifixion "triumphed over evil and sin." He expressed hope that "will draw us closer to the victims of terrorism, that blind and brutal form of violence." At the end of Mass, he chatted briefly with the former king and queen of Belgium, Albert II and Paola, who attended the ceremony. In his speech, Francis cited recent attacks in Belgium, Turkey, Nigeria, Chad, Cameroon, Ivory Coast and Iraq. Separately, in a condolences telegram, the pope said he was saddened by "the great loss of life caused by the terrorist attack" during a match in an Iraqi soccer stadium Friday. That attack, claimed by Islamic State group, killed more than 40 people. Francis said he prayed that the Iraqi people would, in response to the attack, "be strengthened in their resolve to reject the ways of hatred and conflict to work together'" for a future of mutual respect and freedom. 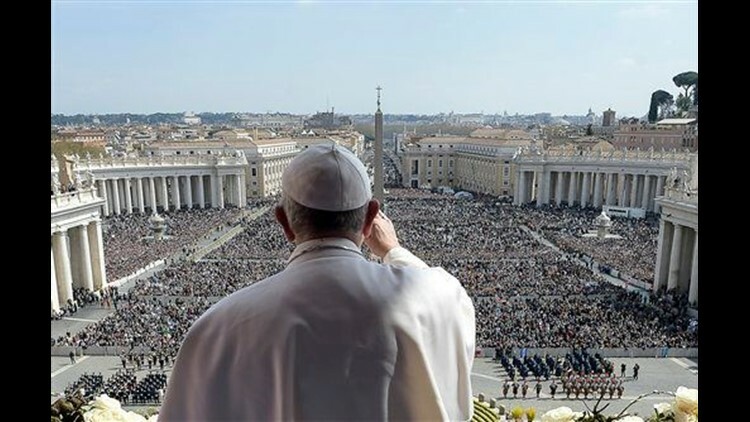 In his balcony speech, Francis said Easter "invites us not to forget those men and women seeking a better future, an ever more numerous throng of migrants and refugees — including many children — fleeing from war, hunger, poverty and social injustice," he said. As he has done repeatedly, Francis lamented that "all too often, these brothers and sisters of ours meet along the way with death or, in any event, rejection by those who could offer them welcome and assistance." Some European countries have erected barbed-wire fences and other barriers to keep out those who continue to arrive on Greek and Italian shores after risky sea voyages on smugglers' boats. Another strategy has been for some European countries to express a preference for accepting Christian refugees over Muslim ones — which would effectively rule out the vast majority of Syrian refugees. Most recently, a host of countries along Europe's main migrant route north of Greece to central Europe have simply closed their borders to refugees, stranding thousands of refugee families at different border points. Francis also decried the destruction and "contempt for humanitarian law" in Syria, millions of whose people have fled to Europe or to refugee camps closer to their homeland. Ariel Schalit contributed from Jerusalem.